Freeze-dried foods are an essential component of any apocalypse survival kit. Freeze-drying is a process that was developed during World War II as a way to quickly and easily transport medication to troops and shortly thereafter was applied to food. Freeze-drying is a method that dehydrates food or other substances in order to preserve them and make them easier to transport. It is an ideal way to store food for an apocalypse. Freezing — The food must be frozen and brought down to a temperature low enough for the next step to be effective. Vacuum — The product must be placed under a vacuum, allowing the frozen liquid to vaporize without becoming a liquid. This process is known as sublimation. Heat — In order to speed up the sublimation process, you must apply heat to the food. Condensation — Condenser plates are used to convert the vaporized liquid left in the vacuum chamber to a solid state, thus finishing the process. Any kind of food can be freeze dried but if you’re preparing for an apocalyptic event, you will most likely want freeze-dried foods with the most nutrients possible. Meat, fruit and vegetables are all nutrient-rich and vital to a balanced diet so you will probably want to freeze dry plenty of those items. Oftentimes, you can buy entire pre-cooked meals that are freeze-dried and all you have to do is add water and eat. Many people choose to invest in freeze-dried foods for their apocalypse preparations because freeze-drying food makes it last significantly longer than a lot of other methods of preservation. If stored correctly, freeze dried foods stay good for up to 25 years. To increase longevity, make sure to store your food in a place with minimal temperature fluctuation and a temperature that stays under 75 degrees. It does not matter if your food is colder than 75 degrees, as long as it is not stored at higher temperatures. In addition to making food last longer, freeze-drying has a number of other advantages. For example, when it is freeze-dried, food is much lighter in weight and easier to carry. You can actually make your food supply approximately 70% to 90% lighter, which is ideal in an apocalyptic situation where you may need to stay mobile. Freeze-drying also eliminates the need for extensive food preparation and allows you have food ready to eat in minutes. If you cook your food before you freeze-dry it, all you have to do is add either hot or cold water to prepare your food. Another thing that people like about freeze-drying their food is the fact that it is a way of preserving the food that does not strongly impact the taste. Once you add water, your food will very closely resemble the food before it was freeze-dried. The taste, smell, and texture is often almost identical to the initial food. Freeze-drying your food is great for apocalypse survival, but does have a few downsides when compared to other methods of storing food. Freeze-drying takes up more space as the food does not shrink in any way during the process. It is also the most expensive way to preserve food and if you are doing it yourself, you need a lot of specialty equipment. 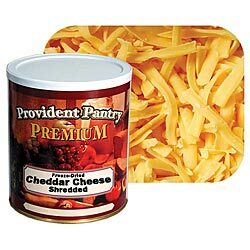 Freeze-dried foods are an excellent way to store food for anybody preparing for the apocalypse. The freeze-drying process significantly increases the shelf life and makes it lighter in weight while still retaining qualities such as taste, texture and aroma. While acquiring freeze-dried food can be more expensive, it is worth it for the knowledge that in the event of an apocalyptic event, you will have easy to prepare, accessible food.